Fast development and time to market at predictable scaling costs are critical for success in the IoT market. 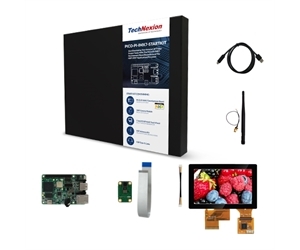 To enable Android Things hardware platforms to meet these goals TechNexion has worked with Google and selected a development platform based on the i.MX7 applications processor family from NXP Semiconductors. PICO-PI-IMX7 is a highly integrated multi-market applications system with advanced features designed to enable secure and portable applications within the Internet of Things. The platform has been qualified and tested by Google to run Android Things at optimal performance. Android Things lets you build professional, mass-market products on a trusted platform, without previous knowledge of embedded system design. It delivers security at the scale you need it via Google-managed updates and verified boot. Android Things reduces the large upfront development costs and risks inherent in getting your idea off the ground. When you are ready to ship large quantities of devices, your costs scale linearly. In addition, on-going engineering and testing costs are reduced by updates. TechNexion PICO-PI-IMX7 platform can be applied in a wide range of applications ranging from locks, to door controls, to fire alarm thermostats, to appliances, to lights, to plugs, to moisture and temperature sensors, and applications with high level of complexity. TechNexion is one of Google’s hardware partners selected to deliver Android Things development platform to facilitate fast prototyping and product development at predictable scaling costs. To enable this fast development and time to market TechNexion’s platform consisting of PICO-PI baseboard PICO-IMX7 system on module based on the NXP i.MX7 applications processor family has been qualified and tested by Google. The PICO-PI-IMX7 was chosen for its exceptional processing and low-power performance; both critical for IoT end products. 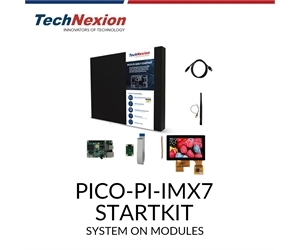 We also offer PICO-PI-IMX7-STARTKIT developer kit, that provides all the hardware that customer needs to speed up prototyping and time to production.